Heya humans, what’s up?!?! I haven’t checked in for a while, an’ wanted to fill ya in on some stuff goin’ on. First, my buddy Zappa is in a foster home now, an’ he’s doin’ pretty good with the human who’s fosterin’ him… he’s still got lots to learn ’bout bein’ in a home, but everyone is real happy for him ’cause he gotta go to a foster home! Anyways, I do miss him tho… he was my walkin’ an’ car ride buddy! I go on lots of walks with other dogs, like Orchid, but haven’t found a doggy I can play with like I did with Skye an’ Echo. Our humans are workin’ on findin’ me a friend, tho, I know it! I’m gettin’ LOTS of extra attention from staff an’ volunteers since Zappa isn’t here… like last Saturday, this real nice volunteer, Blake, played fetch with me, an’ even helped me dig a hole!!! He’s silly, like me, an’ we had lots of fun! I was worn out after we played for about an hour! I hope he comes in again this Saturday to hang out with me! My new sweater Christine found for me… Maddie tried it on to make sure it fit. I only look a lil serious ’cause she was holdin’ my squeaky toy! They think Blue is a great color on me… what do you think?? That reminds me… on Saturday there’s gonna be a Valentine’s Day party for us dogs! It’s called “Have a Heart for HSGKC’s Adoptable Dogs”, an’ it’s from 1-3pm on Saturday, February 13. Check out our website for more details, but I think it’s cool! Our humans wanted to have a party for us ’cause I guess February has lots of days dedicated to dogs… like this week is Have a Heart for Chained Dogs Week (I think that’s REAL important, btw), an’ February is also Dog Training Education Month, which ties in with HSGKC’s BEG Program. Plus, our volunteers and staff will bring some of us out to meet humans, an’ hang out with ya! I’m excited ’bout that part ’cause I LOVE spending time with humans, like Christine… she usually spends some time with me everyday, an’ knows I like climbin’ in her lap, an’ givin’ her kisses, an’ hugs an’ just lovin’ on her! Even tho I’ve got lots of energy, it’s usually just at first ’cause I’m excited to see someone, then I relax a lil’… most of the time… an’ I still remember the stuff I learned in obedience class, like how to “sit”, an’ “lay down”! I had my pic taken with Jai for Valentine’s Day, too, and it is pretty darn cute… so be sure to check us out on Facebook an’ Instagram! K… gotta run! I hope I get to see you Saturday! Heya humans, Ah hope ya’ll are doin’ good an’ enjoyin’ sum ah this sunshine! We’re all happy ta see da sun after all da rain da pass coupla days… but dere’s still ah big ole’ mud puddle for us ta roll ’round in… he he! So, Ah wanna update ya ’bout some ah da tings goin’ on here. Mah newest roommate, Aubrey, went to a foster home last week. Nemo got himself a forever home, an’ he’s real happy dere. Ah coupla puppies, Lass an’ Cookie got themselves forever homes, too, an’ Ah’m real happy for dem. ‘Cause dese oder dogs found forever homes, that gots me thinkin’ ’bout some stuff… Ah tol’ ya ’bout da kinda forever home Ah’d lak last time, but what Ah was thinkin’ ’bout is dere are lots ah Pit Bulls an’ Pit Bull mixes lak me here at HSGKC… an’ Ah’m wonderin’ ’bout why dat is. Ah know Ah’ve heard some people talkin’ ’bout us, an’ Ah suspect it’s ’cause folks maght be ah bit ah-fraid ah us ’cause ah stuff dey hear. So, Ah wanna tell ya’ll ’bout some ah our real good qualities so maybe some ah ya maght consider givin’ dogs lak me a chance. See, here’s what ya’ll need ta know ’bout us Pit Bulls… dis is da important stuff, so pay real close attention: WE LOVE HUMANS!!! We love bein’ wit humans even more dan we lak bein’ wit oder dogs! Most ah us are real, real good wit chiren (sometimes we jus’ get real happy an’ jump up, an’ we try ta be gentle but we can be ah bit much for small, small chiren). We love ta be somethin’ call “lap dogs”, meanin’ even do we’re kinda big, we love relaxin’ wit humans an’ layin’ on dem! We love givin’ kisses (Brownie gives LOTS of kisses, an’ Ah do too, but Ah’m ah lil less intense ’bout kisses dan he be). Almost all of us Pit Bulls here at HSGKC lak oder dogs… now summa us are kinda picky ’bout da dogs we like, but dat’s okay… no one laks everyone dey meet, ya know? Ah know it ain’t always easy ta have ah Pit Bull ’cause when ya move ya gotta find ah city an’ ah place ta live where we’re allowed. An’ when we’re your dog, you an’ your dog respresent all us Pit Bulls out dere, so we gots ta be on our very bestest behavior… but dats not too hard ta do! We do gots some energy, an’ we’re strong, but after we’ve been for ah walk, or ah jog, or had some good ole’ play tahme, we jus love coolin’ down an’ cuddlin’ up wit our humans. We’re not real hah energy dogs, ‘cept when we’re pups… but we grow outta dat pretty fast. We’re smart, too, an’ sensitive ta our humans an’ envih-roh-ment, which means dere’s more goin’ on wit us dan ya maght think. Well, Ah hope dat maybe Ah tole ya somethin’ new ’bout Pit Bulls dat ya didn’t know before, an’ dat if ya want ah best friend… ah dog who’ll go on walks an’ stuff wit ya, chill wit ya, an’ be your companion, den maybe ya’d think ’bout givin’ one of us ah forever home. Ah’m gonna go for now… Ah think Pete an’ Christine are gonna try an’ get me anoder roommate! Hey humans! What is up?!?! My name is Zappa… kinda cool name, huh?!?! I heard our humans say I’m named after some other human who was somethin’ called a “musician”, an’ even tho I dunno what a musician is, the dude must’ve been a cool guy for me to be named after him! Anyways, here’s my basic info, then I’ll get to the more interestin’ stuff! 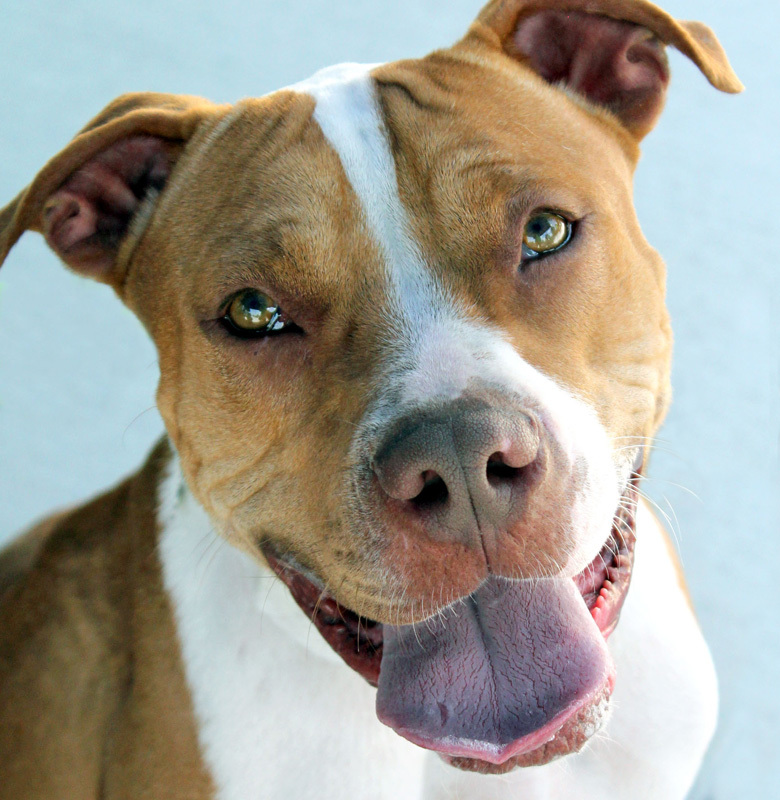 I’m Pit Bull mix with some real big ears (all our humans love my ears!!! ), I’m a lil over a year old, an’ I came here ‘cuz I was a stray an’ went in a yard with some doggies who were like SUPER protective of their yard, an’ kinda chased me off, but I got hurt while runnin’ for safety. I’m good now, just got a few scars, but I’m still handsome! I wanted to do this blog thing today cuz I heard there’s gonna be a satellite adoption event tonight at Tail Waggin’ PetStop in the Crossroads, an’ I don’t think I’m goin’ but my friend, Kenzie, might go (she’s been to a few satellite thingys an’ says they’re FUN! ), an’ maybe some of the humans goin’ to First Friday might meet her or wanna meet me after they see a pic of me an’ how handsome I am! 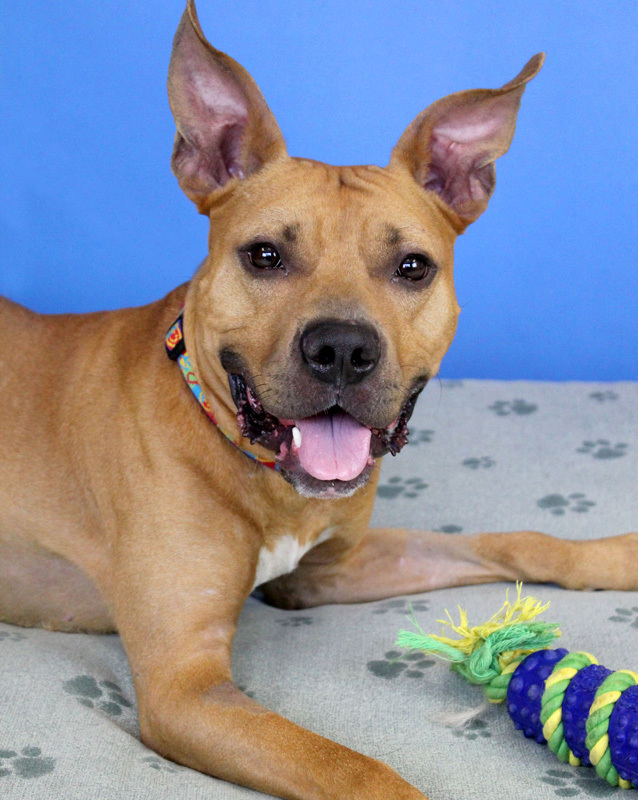 I wanna talk a lil ’bout the kinda forever home I wanna have someday… I’ve heard the dogs here talkin’ an’ know that sometimes it takes us Pit Bulls longer to find forever homes than other dogs. I think maybe it’s cuz we got a bad reputation cuz some not very nice humans use us for fighting each other. I think I’m a good example of how cool most of us Pit Bulls are, good natured an’ everything… I mean, c’mon, even tho I hate to admit it, I went into the WRONG yard with some dogs who weren’t real happy ’bout me bein’ there… but instead of not likin’ other dogs, I do! I LOVE Kenzie an’ am real happy to have a friend to run ’round an’ play with! We wrestle, an’ play tug an’ stuff. I’m real good with humans, too! Like I know how to “sit” an’ “shake”, an’ even when I jump on our humans cuz I’m SO excited an’ happy to see them, I’m gentle… I just put my paws up on them so they’ll pet me! K, that’s enuff serious talk…now I wanna tell ya just a lil ’bout the kinda forever home I’d like! I’d really love to have a doggy brother or sister to play with, but I’d have to check ’em out first an’ make sure we “mesh” like me an’ Kenzie do, ya know what I’m sayin’? I’m great with humans, an’ I’ve got LOTS of energy, so I’d love active humans to take me on lots of walks or runs! I have been known to jump a fence on occasion, but if I got a friend to play with, or if a human’s outside with me, I stay in the yard I’m supposed to be in! I do however think cats are LOTS of fun to chase… an’ I get it that some humans like cats (I will never understand those creatures), so my forever home should be kitty free! I’d really love a house, an’ think I got too much energy sometimes for an apartment. I keep my kennel clean, so I’ll be good an’ won’t potty in the house! I’ve gotta run… time for me an’ Kenzie to go play! Remember, if ya wanna learn more ’bout me, an’ the thingy at Tail Waggin’ PetStop tonight, go to hsgkc.org. See ya!